China Government is geared up to control inflation in coming months. It intends to control inflation by controlling money supply and lending. Fears of asset bubble and price rise are haunting Chinese government. Analysts are expecting drastic measures from the Central Bank including further rate rises. China increased interest rate by 25 basis points on Christmas surprising analysts. China inflation has reached 28-month high due to rising food and asset prices. Excess cash in the system is seen as major driver of inflation. The task of taming inflation will be a priority for the Chinese government in the next year, Reuters noted. A deputy governor of Central Bank, Hu Xiaolian issued a statement on its website on Monday. Hu reiterated the central bank’s determination to drain excess cash from the financial system by using all tools at its disposal such as interest rates, reserve requirement ratios, open market operations and more. Foreign investors view China’s inflation-controlling measures as a signal for strong growth of Chinese economy. Chinese officials are confident that the growth of Chinese economy is supported by strong and sustained recovery. The Reserve Bank of India (RBI) will take ‘appropriate measures’ to tackle inflation, the finance minister said on Saturday, though he added that India could not go on a "reverse growth path". Pranab Mukherjee was speaking a day after data showed industrial output accelerated much faster than expected in July, strengthening the case for further monetary tightening by the central bank to tame near double-digit inflation. Recent signs of cooling growth in Asia’s third-largest economy, along with a sluggish global economic recovery, had tempered expectations for a rate increase at the central bank’s policy review on Sept. 16. But economists said the surprisingly strong industrial performance boosted the chances of a rate rise next week. "Inflation is a concern. I am concerned that prices are increasing," Mukherjee said in Kolkata. "RBI will take appropriate measures as and when needed. But at the same time, I cannot go on a reverse growth path." Pranab Mukherjee said India would likely grow between 8.5-8.75 percent in the fiscal year ending next March, therefore possibly exceeding earlier growth estimates of 8.5 percent. Industrial output rose 13.8 percent in July from a year earlier, nearly double analysts’ forecasts for a 7.7 percent rise. It was the fastest growth since April. A surprisingly soft inflation number has all but ruled out the chance of an interest rate hike next week. The ABS Consumer Price Index’s headline figure rose 0.6 per cent in the June quarter compared with the previous quarter – that was well below the median analyst forecast of a 1 per cent rise. Of the 21 economists surveyed by Bloomberg the lowest estimate was for a 0.8 per cent rise, while many economists were a long way off the mark, with one forecasting a 1.2 per cent surge. The relatively modest 0.6 per cent June quarter increase leaves headline inflation at 3.1 per cent for the year to June. But the two measures of underlying inflation preferred by the Reserve Bank, which take out the most volatile price movements, rose only 0.5 per cent in the quarter. That meant the rate of underlying inflation was 2.7 per cent for the year to June, well inside the Reserve Bank’s 2-3 per cent target band. St George Bank’s chief economist Justin Smirk says today’s inflation data has taken the chance of a rate hike off the table at the Reserve Bank’s August meeting next Tuesday. "It is without a doubt highlighting that right now the RBA does have clear time to wait, pause and ponder on the global events and just how our own economy is making the shift from being driven by public stimulus and back towards more private investment," he told Reuters. "So, there’s no rate-hike next week." 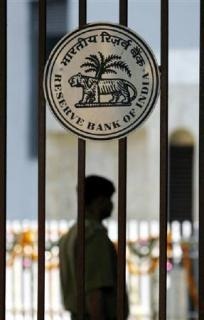 The Reserve Bank of India (RBI) raised interest rates more forcefully than expected on Tuesday, signalling its urgency to stamp on inflation that is on track to hit double-digits for the sixth month running in July. One-year overnight interest rate swap rates jumped after the Reserve Bank of India (RBI) notched up its fourth rate rise this year and said it was "imperative" to normalise policy in line with the economy’s growth and inflation. Before Tuesday, the RBI had promised a "calibrated" exit from the loose monetary policy adopted during the global downturn, which markets had taken to mean 25 basis point rate hikes on Tuesday and again at quarterly reviews set for October and January. "The dominant concern that has shaped the monetary policy stance in this review is high inflation," the RBI said. "With growth taking firm hold, the balance of policy stance has to shift decisively to containing inflation and anchoring inflationary expectations," it said. Bond yields and swap rates rose in reaction to the RBI’s decision. The 10-year benchmark bond yield gained 3 basis points to 7.70 percent. The most-traded 1-year overnight indexed swap rate jumped 19 basis points to 6.1 percent, its highest since November 2008. The RBI lifted the repo rate, at which it lends to banks, by 25 basis points to 5.75 percent, which was in line with expectations. But its bumped up the reverse repo rate, used to absorb excess cash from the system, by 50 basis points to 4.50 percent. A 25 basis point rise had been expected. Analysts said the moves showed the RBI was trying to take more decisive action following criticism that it had acted too timidly so far to tackle rising prices that the authority acknowledged had spread beyond food to the broader economy. "Of course, they are behind the curve on inflation," said Dariusz Kowalczyk, senior economist and strategist at Credit Agricole CIB in Hong Kong. "They are trying to catch the train that has left the station and they are running to accomplish that. Unfortunately, they were late to the races and this means they would have to tighten more than they would have if had they started earlier," he said. 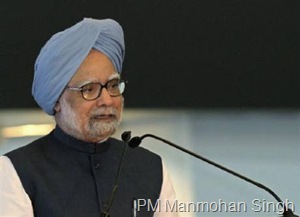 Prime Minister Manmohan Singh on Saturday reiterated his prediction headline inflation would ease to 6 percent by December, a forecast more optimistic than that delivered by his economic advisers a day before. The prime minister’s Economic Advisory Council had said inflation would be at 7-8 percent by the year-end, compared with 10.55 percent in June, and its chairman recommended strong monetary action to tame runaway prices. Singh’s statement comes amid a growing divergence between the government and the central bank on the need for monetary tightening to cool inflation that has been in double digits for five straight months. New Delhi puts high food prices as the cause and argues normal monsoon rains would cool inflation, while the Reserve Bank of India (RBI) says demand-side factors will continue to keep up pressure on inflation. On Saturday, Singh backed his officials’ view. "The present high rate of inflation is mainly due to food price inflation," he told a conference of top federal and state policymakers gathered to assess the country’s development plans. "The government has taken a number of steps to curb inflation. With a normal monsoon, which is the expectation at present, the rate of inflation will abate in the second half of the year."